Emily Rodda is a mesmerising storyteller. She makes the reader hold their breath and plunge into Rye and Sonia’s worlds as they venture once again beyond the safety of The Weld’s outer walls. 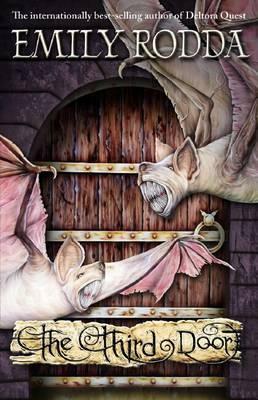 This time Rye is able to choose the ancient wooden door and - with his three companions, Sonia, Sholto and Dirk, - embark on their third quest to save their home from the skimmers. Skimmers have always terrorised life in the Weld at night, but the children’s discovery beyond the Silver Door, intensified this threat. The Lord of Shadows is breeding skimmers, or slays, which can attack in the daylight hours too. Rye and his friends face many perils as they use their charm, wits, magic and all weapons at their disposal to discover the answer to their problems. But the source of danger may be closer to home than they realise. Having not read the first two books in the Three Doors Trilogy, there were times in the story I felt confused and a little lost. But I was kept fully engaged by the richness of the worlds Rodda has created, the beautiful writing and the depth she achieves in the wonderfully complex and likeable characters which populate the adventure. This is a story which explores, not just the black and white of people – and societies – actions, but also the many shades of grey. Mysterious and intriguing, this book was well paced with quieter parts allowing space to digest information and admire the scenery before being plunged back into action. An exhilarating ride for all lovers of fantasy, magic and epic adventures from 10 years and up. The Third Door is the final book after The Golden Door and The Silver Door. Readers would get the most out of them if they read them in order. Emily Rodda has written many popular fantasy series for children including Deltora Quest, Rowan of Rin and Fairy Realm.